FGCU vs. Florida – 7 p.m.
Pepperdine at Wisconsin – 8 p.m.
Texas State at Texas – 9 p.m.
Baylor at Oregon – 10 p.m.
For the remainder of Friday’s schedule and all of the NCAA Tournament and NIVC streaming and live stats links, click here. Florida moves to 22-0 all-time in the NCAA first round with its sweep of Florida State. The Gators followed 16 kills by Paige Hammons to victory, while Allie Gregory notched a career-high 22 digs. ACC Player of the Year Payton Caffrey paced FSU with 14 kills. Texas State earned its first NCAA Tournament victory, a 3-1 win over Rice, behind a Cheyenne Huskey double-double (23 kills, 12 digs) and a 48 assist, 12-dig effort by rookie Emily DeWalt. Rice outhit Texas State .245 to .237 and outblocked the Bobcats 11-9, but trailed 8-3 in aces and 65-57 in kills. Nicole Lennon notched 19 kills, 12 digs and four blocks to pace the Owls, while Anota Adekunle turned in 15 kills and 10 blocks on a team-best .481 effort. Four Pepperdine players managed double-digit kills in the team’s five-set win over Northern Iowa, which advanced the Waves to the second round for the first time since 2011. Shannon Scully (22 kills, 13 digs) and Hannah Frohling (16 kills, 10 digs) notched double-doubles for the Waves. Northern Iowa outhit Pepperdine .289 to .242 and outblocked the Waves 10-4 in the loss. Karlie Taylor posted 23 kills, 13 digs and four blocks to pace the Panthers. Texas wins its 32nd straight NCAA first round match with its sweep of Stephen F. Austin. Logan Eggleston paced the Longhorns with 14 kills, while Micaya White (12) and Yassmeen Bedart-Ghani (11) followed. Haley Coleman put down a team-leading seven kills in her final match for the Jacks. Wisconsin outhit Green Bay .295 to .030 and outblocked the Phoenix 11-5.5 in a sweep. Molly Haggerty led the way with 10 kills. and 15 digs. Alexandra Zakutney notched a career-high 13 kills to guide the Phoenix attack. FGCU won its first NCAA Tournament match, besting UCF in five sets, while also picking up the program’s first win over a ranked foe. The victory also gave the team its winningest season in the Division I era with 27. 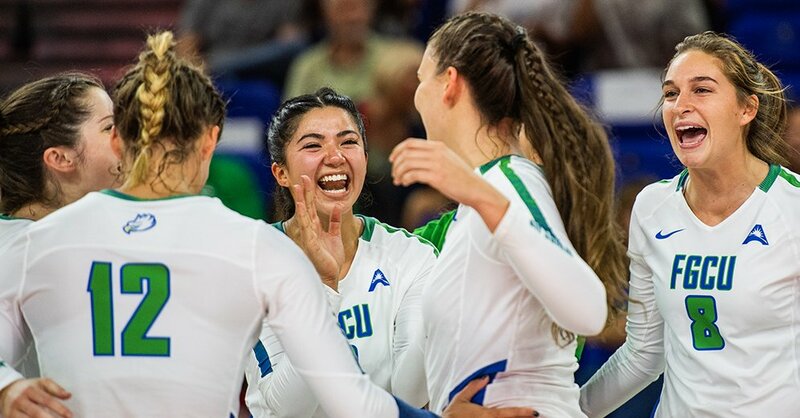 Cortney Van Liew did it all in the win for FGCU, recording 25 kills, 12 digs, two blocks and an ace, while Snowy Burnam added 15 kills and a career-high 26 digs..
Dana Axner broke FGCU’s season digs mark with her 29th of the match, giving her 607, besting Whitney Hendry‘s 606 from 2005. UCF’s Jordan Pingel snapped the school’s season digs mark, finishing with 597 on the year, including 26 against FGCU. McKenna Melville led the Knights with 24 kills, 16 digs and three blocks. Baylor trailed 2-0 in the match and 18-14 in Set 4 before rallying to finish off a five-set victory over Hawaii, reaching its three straight 20-win season in the process. Aniah Philo (14 kills, 21 digs) and Gia Milana (7 kills, 5 digs) each posted her 1,000th career kill in the match for the Bears, while Shelly Fanning guided the team with 18 kills and a career-high 10 blocks. Tita Akiu pulled up a Hawaii rally-scoring match record 34 digs in the loss, while Norene Iosia posted her fifth triple double with 11 kills, 14 assists and 15 digs. Oregon’s Lindsey Vander Weide turned in 18 kills, 10 digs and six blocks while hitting at a .447 clip to pace the Ducks in a 3-1 win over New Mexico State. Oregon outhit NM State .315 to .207 and outblocked them 11.5 to 4, but the Aggies managed four more kills in the match (54-50). Julianna Salanoa (15), Tatyana Battle (14) and Savannah Davison (11) led the Aggies with double-digit kill efforts. Davison rounded out a double-double with 10 digs.